Removes excess oil and deeply cleanses oily skin. 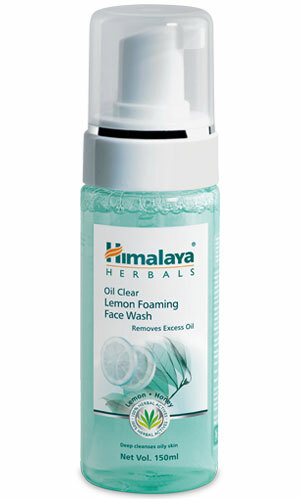 A soap-free, herbal formulation that gently cleanses your face, Himalaya Herbals Oil Clear Lemon Foaming Face Wash is enriched with Lemon, an astringent and a cooling agent, and Honey, which has natural, deep-cleansing properties. Unlike soap, your face will not feel dry and stretched. Use regularly for clean, fresh and glowing skin. Moisten face and neck; apply a small amount of Himalaya Herbals Oil Clear Lemon Foaming Face Wash and gently massage the lather using a circular motion. Wash off and pat dry. Use twice daily. Follow with Himalaya Herbals Nourishing Face Moisturizing Lotion. Use Himalaya Herbals Oil Clear Mud Face Pack once a week to rejuvenate and revitalize your skin.